Cellular For Less, online at CellularForLess.com, is the destination for business users and large organizations looking for accessories for wireless phones. At Cellular For Less, you can buy speakerphones, cell phone cases, portable batteries, and blue tooth wireless car kits. You can also find charging cables, vehicle amplifier car kits with cradles, gel covers, leather folio cases, and belt clips at Cellular For Less. Screen protectors, cleaning cloths, headsets, travel chargers, and waterproof hard cases are on sale at Cellular For Less as well. RetailSteal.com has the best Cellular For Less coupon codes, Cellular For Less discounts, Cellular For Less coupons, and Cellular For Less promo codes. Shipping and handling rates at Cellular For Less depend on the price of your purchase and your shipping destination. See website for full details. Some exclusions may apply. Find great deals on iPad Accessories at CellularForLess.com. Click link for savings. Buy the Blackberry PlayBook at CellularForLess.com. Click link to purchase. Sign up for the Corporate Club and enjoy online discounts at CellularForLess.com. Click link to sign up. Buy a Stereo Earbud Headset or Headphones with a call control button and pay just $14.99 at Cellular For Less. Click link to purchase. Pay only $17.99 for a Blackberry car charger at CellularForLess.com. Click link to buy. Purchase the Freedom Pro Bluetooth Wireless Keyboard at CellularForLess.com. Click link to buy now. 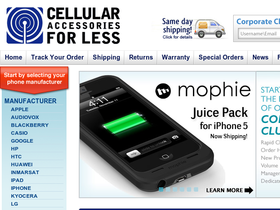 At CellularForLess.com, get same-day shipping on your in-stock order. Click link to find out how. Buy desk phones for as low as $107.99 at CellularForLess.com. Click link to purchase.